In this Kitchen Nightmares episode, Chef Gordon Ramsay visits Mama Maria’s, Brooklyn, New York, an Italian restaurant attached to a pizzeria, owned by John Esposito, who became overwhelmed running both restaurants and focused on the pizzeria. Gordon orders the tortellini di patate, spaghetti meatballs and the margarita pizza. Server Fran brings the desserts to the table, one of them is mouldy but this is deemed to be okay as they are just for display. The tortellini are bland and Gordon believes they are frozen, the spaghetti and meatballs are also frozen, taste dry and the pizza was full of grease. Gordon heads into the kitchen to talk about the food, John tells Gordon that it takes too long to make the meatballs fresh. Gordon observes a dinner service and notices that John stays in the pizzeria and the kitchen sends out food at a fast pace. A vegetarian customer finds a bone in her pasta as the sauce has meat in and another customer is found being sick in the bathroom. Gordon inspects the lobster and finds it to be bad. An ambulance has to be called for the vomiting customer and Gordon shuts the service down. Gordon arrives the next day and inspects the food storage. He is disgusted to find buckets of frozen pasta, meat and sauces covered in mould. Gordon informs them that the sick customer is feeling better but lays out the bad food to ensure it does not happen again. Gordon tells John that he needs to let go of the past after he discovers that the Specials have not been changed since his parents passed away. Gordon gives the restaurant a makeover, removing the awning and putting a new sign out the front. The interior and the menu are also updated. On relaunch night, Gordon invites food critics, bloggers and writers from the New York Observer. The kitchen gets off to a good start but John is not managing his staff and is found at the bar. He steps up to the task, mingles with customers and takes control of his staff. After relaunch night, there are positive comments from the critics and the restaurant is on it’s way back to being a successful restaurant. 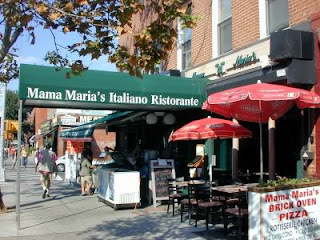 I went to Mama Maria's one afternoon for lunch. I walked into the restaurant and walked around for at least 5 minutes. I picked up a menu. I called out "hello" several times and no one ever came out from the back. Maybe the place is cleaner. Maybe the menu is simpler. Maybe they are making money. But, I will never walk into this restaurant again. This is probably the only episode that the owner and most of the restaurant staffs are likable. And I'm glad they're not only still open, but thriving. I'm guessing because the guy was awkward, they couldn't really try to force him to put on a performance as they likely do with most other episodes. I don't know that I like him that much, but I can sympathize for him to some degree at least. It's one of my favorite episodes so far. I really felt like Gordon cared a lot about John and his restaurant. For some reason he seemed more determined than usual to help him thrive. I'm genuinely surprised that this place is still open. The guy was awkward, kind of dopey and didn't seem to have the slightest clue of how to run a business. Yet here they are. Good for them. Probably one of the better episodes that I have watched. I’m glad things worked out for the owner after Gordon left.